It’s like beef and barley. Or mushroom and barley. Only together. And with quinoa. I really wanted to make a soup (not a stew). With the holidays, there’s always so much heavy food going around that when I’m not at a party, or a holiday meal, or a pre-holiday meal, or a post-holiday meal, I generally want to lighten things up a bit, if for no other reason than to pay it forward to all those cookie parties I know are coming up. 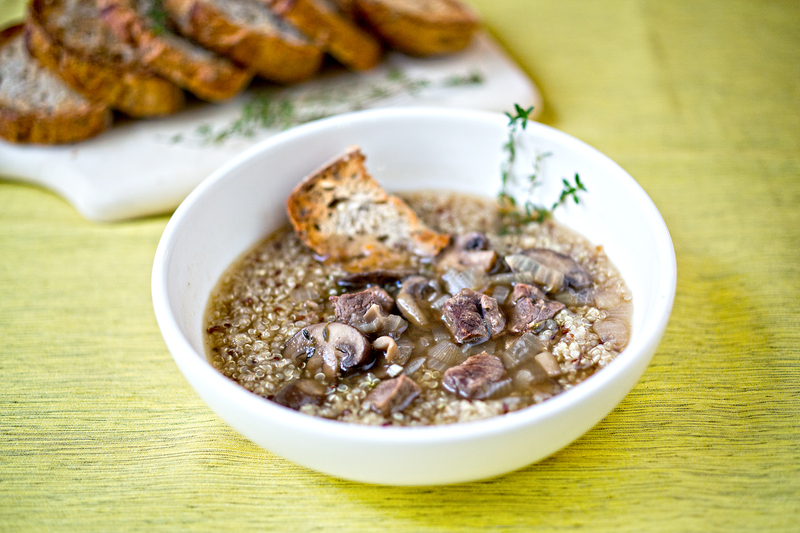 I was thinking of combining the two popular “and barley” soups (beef and mushroom), only with diced elk. The problem? El Gallo doesn’t like barley. Which is a sad, sad shame because I love the robust, chewy texture of it myself. But you know what? I hate bacon and I never let him eat it. It’s only fair that I give something up too, right? The whole order of this recipe was a little bit tricky. Do I do the onions first then add the meat or do I do the mushrooms first, but once all of that junk is in the pot the meat won’t exactly sear. I settled on starting with the mushrooms so they would brown, adding the onions, and searing the meat in a separate pan. Aside from having to use two pans and burners (which I generally frown upon), it all came together beautifully and it didn’t take goddamn forever either. 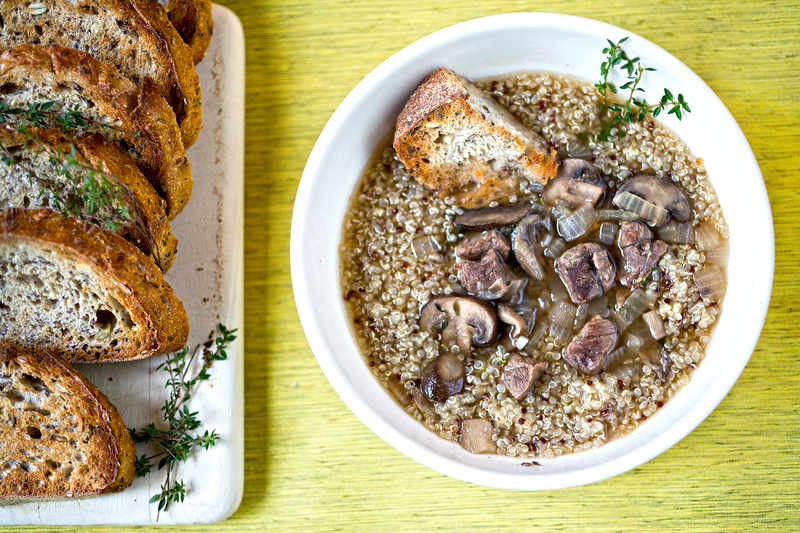 While an “and barley” soup usually requires cooking the barley in the soup, quinoa is a little bit more delicate. You don’t want those fluffy little kernels to get too soggy and fall apart, so I decided to cook it separately in the rice cooker and just spoon the soup over it. The only thing to keep in mind is to make sure and let your soup simmer enough so the meat isn’t too chewy. First, rinse the quinoa and cook it with the 2 cups of water. Once it's tender and has absorbed all the water (about 15 minutes), set aside until the soup is done. Heat 2 T of the oil in a soup pot over medium high heat. Add the mushrooms and sauté until starting to turn brown and crispy. Add the onions and sauté until soft. Meanwhile, heat another pan on medium high heat and sear the meat, working in batches if necessary. Add the meat to the soup pot as you go. When finished, deglaze the pan and add the remaining meat and juices to the soup pot. Add 4-6 cups of broth or water to the pot, making sure there is enough liquid to cover. Season with salt and pepper and add the thyme sprigs. Bring to a boil, then simmer until the meat becomes more tender, at least 20 minutes, longer if the meat is really tough. Add the cooked quinoa to the bottom of a bowl and ladel the soup on top. Serve hot. 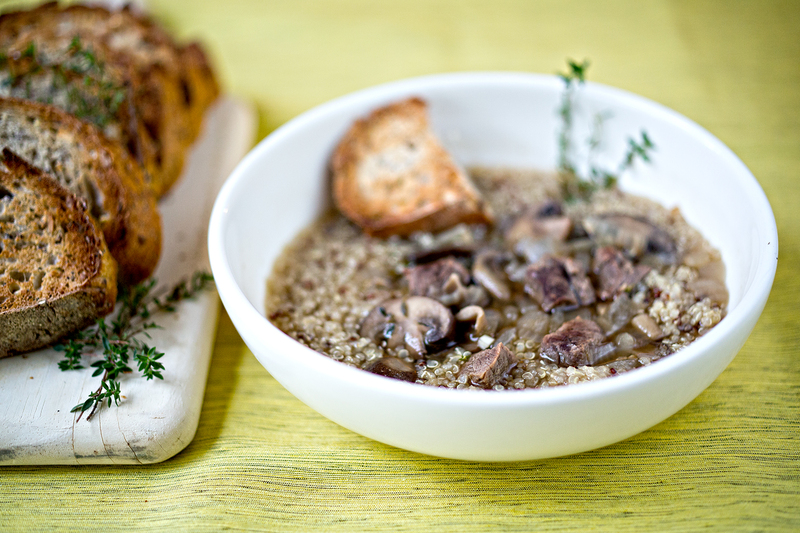 Vegetarian substitution: Just use an extra carton of mushrooms and veg broth instead of beef, and have yourself some mushroom and quinoa soup!